The Telegraph and the Financial Times have reported that UK and EU negotiating teams have agreed on a figure. 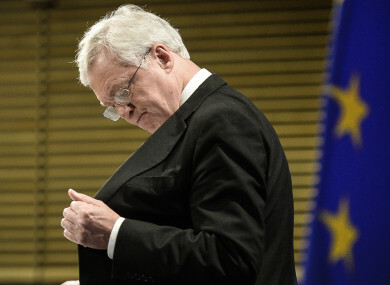 The UK's Secretary of State for Exiting the EU, David Davis reaches inside his inside pocket. BRITISH AND EUROPEAN negotiators have reached a deal for Britain to pay tens of billions of euros to leave the European Union, according to media reports. London and Brussels have agreed on Britain’s financial obligations but had not settled on an exact amount for the so-called divorce bill, both The Telegraph and the Financial Times reported, citing diplomatic sources. Both sides have now accepted the British will pay between €45 and 55 billion, with the final figure depending “on how each side calculates the output from an agreed methodology”, the Telegraph said. Meanwhile the FT reported Britain would cover EU liabilities worth as much as €100 billion, but when structured as net payments over many decades that could drop to less than half that amount. The newspapers said negotiators, headed on the British side by leading Brexit official Olly Robbins, reached the understanding at meetings in Brussels last week. An agreement would be a major breakthrough as Britain prepares for an EU summit in December where it is hoping to get the go-ahead to start the next phase of talks on future trade ties with the EU. It would leave two major areas on which the two sides still do not agree – expatriate citizens’ rights after Brexit and the future of the Irish border. “The deal on the money is there,” a senior source involved in the negotiations told the Telegraph. “It’s now the ECJ (European Court of Justice) question and Northern Ireland that are the outstanding issues ahead of the Council,” the source said. One key area of contention is whether the 3.2 million EU citizens living in Britain will continue to be allowed to appeal to ECJ jurisdiction or if their rights will be governed by British courts, as London insists. So far both sides have avoided publicly declaring a clear-cut number for what Britain owes the rest of the EU. Prime Minister Theresa May had offered to cover Britain’s contributions to its budget in 2019 and 2020 – a total of around 20 billion euros. That pledge was reportedly doubled to €40 billion at a ministerial meeting in London last week. A third EU source with knowledge of the talks said the text of the financial agreement would allow a “low figure” to be generated for the British public but would also give the EU the certainty it is looking for. Asked about the reports, a spokesman for Britain’s Department for Exiting the European Union said “intensive talks” are taking place in Brussels this week, and did not address the divorce bill directly. We are exploring how we can continue to build on recent momentum in the talks so that together we can move the negotiations on to the next phase and discuss our future partnership. Email “Britain will pay at least €45 billion to leave the EU - reports”. Feedback on “Britain will pay at least €45 billion to leave the EU - reports”.